general dental care services. Riverheart Family Dentistry understands the prevalence of halitosis as well as the disruption it can cause. Patients in O'Fallon can trust us to provide proven, long-term treatments that address the root causes of bad breath. Dr. Travis Schwarz is an experienced and compassionate dentist who realizes the importance of a fresh and confident smile. If bad breath is impacting your personal relationships or causing you to avoid social situations, we would love to tell you more about our halitosis treatments. Addressing bad breath with mints or chewing gum is only masking your symptoms. For the most effective and long-lasting solutions, Dr. Schwarz treats the source of your halitosis. There are many factors that can contribute to chronic bad breath, ranging from an underlying medical condition or medication to poor dental hygiene and gum disease. In many cases, halitosis treatment begins with better brushing and flossing. The food debris and bacteria left in your mouth after meals must be properly removed. If not, specific compounds will form that emit a foul, unpleasant odor. Your tongue is a major source of bacteria; therefore, diligent efforts to clean your tongue while brushing must be adhered to when treating bad breath. Dr. Schwarz may also recommend an additional oral hygiene product to help you eliminate this lingering or embarrassing condition. At Riverheart Family Dentistry, we will carefully examine your oral health to determine the cause of your bad breath before we recommend treatment. If gum disease is the culprit, our office proudly provides the latest in periodontal therapy to restore both your smile and freshen your breath. It is our pleasure to not only improve the health of your smile, but to also help you smile more confidently. We provide halitosis treatment and other general, restorative and cosmetic dental services with the comfort and convenience you deserve at all times. 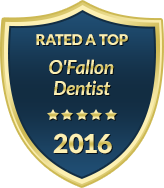 Contact us today to schedule your halitosis treatment consultation with a gentle, skilled dentist in O'Fallon today.